Speedskating Abuse Report Inaccurate And Incomplete? : The Two-Way The report included an email praising the embattled U.S. coach, but attributed the email to the wrong speedskater. The investigator apologized for the faulty attribution, but said it did not affect the report's conclusions. Speedskating Abuse Report Inaccurate And Incomplete? 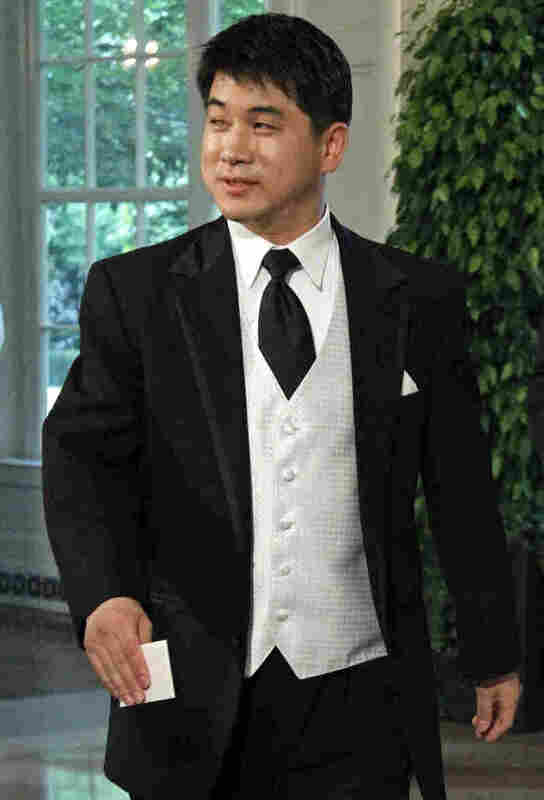 U.S. Speedskating coach Jae Su Chun arrives for a state dinner at the White House in 2010. Nineteen current and former skaters, including five Olympic medalists, filed complaints accusing him of abuse. A former American short-track speedskater who purportedly praised embattled U.S. Speedskating coach Jae Su Chun in an email included in an executive summary about abuse allegations has confirmed to NPR that he did not create or send the document. "I did not write this email," Ryan Leveille said. "Knowing that I sent no such email, I immediately advised U.S. Speedskating and my attorney contacted White and Case," the law firm that conducted an investigation of complaints filed against Chun and assistant coach Jun Hyung Yeo. Leveille, formerly known as Ryan Cox, said he notified U.S. Speedskating of the error on Sunday. U.S. Speedskating has yet to comment, but Greg Little, who conducted the investigation, told NPR the email quoted in the report was written by another speedskater. "We apologize for this error of attribution," Little said. "[It] does not affect the conclusions of the report." The quoted email says, in part, "You are one of the best coaches in the world!" The email was used to counter a claim that Chun had physically abused Leveille in Harbin, China, in 2008. The incident was included in complaints filed by 13 speedskaters. Leveille has retired from the sport and is a student at the University of Georgia. "That inappropriate incident did occur," Leveille said, "but I have put it behind me." NPR has also learned that the U.S. Speedskating investigators did not interview any skaters or staff from Speed Skating Canada who were present last year at an international meet in Poland when American skater Simon Cho sabotaged a Canadian's skate. Team Canada's Olivier Jean was forced out of the final relay of the competition because his skate blade had been bent. Jean told NPR that Chun approached him before the race and said, "I wish you bad luck. I hope you lose." The speedskating report does not include any reference to the alleged comment; it says "we do not believe that there is sufficient evidence to conclude that Coach Chun directed Simon Cho to tamper with the skate." Little acknowledges that neither Jean nor any of the other Canadian athletes or staff was interviewed for the speedskating investigation. "We interviewed a large number of people and in any investigation there comes a time when we need to submit a report," Little said. "We believe we had sufficient information to submit that report." The report is being used by U.S. Speedskating and could be used by the U.S. Olympic Committee and the International Skating Union to determine disciplinary action against Cho and coaches Chun and Yao. Both Chun and Yao are on administrative leave and face possible sanctions for admitting they knew about the tampering incident but didn't report it. Cho, a 20-year-old Olympic medalist, could be banned from the sport for life. Chun denied he ordered Cho to tamper with the Canadian's skate. "My main concern at this point is that there will be an unfair rush to make an example of Simon," said John Wunderli, Cho's attorney. Russell Fericks, Chun's attorney, said his client "does not believe he ever told Olivier Jean 'I wish you bad luck. I hope you lose.' "
"This would have been inconsistent with coach Chun's personal regard for Olivier Jean," Fericks said. But he acknowledges that Chun was upset with the Canadians at the meet and believed they had employed a "team skating" tactic that helped eliminate the Americans from the final. Ed Williams, an attorney for the skaters who have filed complaints against Chun and Yao, said the misattributed email clouds the validity of the report. "This seriously undercuts the worth and reliability of this executive summary," Williams said. "It calls into question [the investigators'] conclusions that there was no physical or mental abuse." Little said he "is comfortable that the facts are consistent with our conclusion." Little's firm was enlisted by the USOC as part of its SafeSport program, which is designed to respond to athlete complaints about abusive coaches. The program was initiated after a scandal in which dozens of coaches from the national USA Swimming program were expelled in response to accusations of physical and sexual abuse. "We count on [investigators] to do the best job possible, given the limitations they may face," said Patrick Sandusky, USOC spokesman. "If their conclusions are not acceptable to the parties involved, they always have the right to go to arbitration." Fericks said he's the source of the misattributed email, which was sent by another athlete who reportedly had a violent altercation with Chun. "We provided [the] unsolicited email to debunk the notion that intimidation and resentment resulted," he said. Little took responsibility for wrongly associating the email with Leveille. "This was my mistake," he said. "I don't think that anyone was trying to mislead me." Little has yet to issue a full report to U.S. Speedskating, which is expected to announce Tuesday a process for disciplinary proceedings against Chun, Yao and Cho. Little did not say when a full report would be available. U.S. Speedskating has indicated it is trying to complete disciplinary proceedings before an arbitration hearing scheduled for Nov. 1. The complaining skaters say they will not skate under coaches Chun and Yao, so they sought arbitration. They worry that their ability to skate for the U.S. team in World Cup and Olympic competition is threatened if the two coaches continue at U.S. Speedskating. If the coaches are dismissed before Nov. 1, the arbitration scheduled for that day may be canceled. That means another level of fact-finding into the allegations of abuse and the tampering incident may not take place. Little said in his report that it may take the arbitration process, with witnesses testifying under oath and with cross-examination, to ferret out the truth.